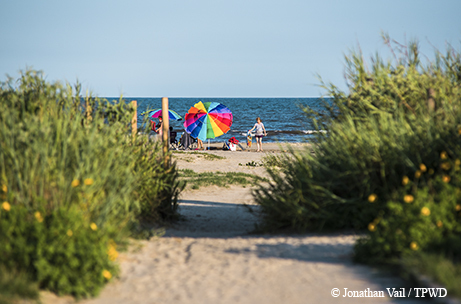 Battered by storms, and awash in history, Galveston’s state park beckons beach lovers. Standing where beach meets dunes at the end of a boardwalk in Galveston Island State Park, I almost see the island the way it once was — waves lapping at a broad expanse of beach, grasses rippling in the breeze over low mounds of sand, tall reeds rising behind them and, over it all, an endless baby-blue sky. In 5,000 years of existence, this barrier island has seen plenty of excitement. Tattooed, nomadic Karankawa Indians, who smeared themselves with dirt and alligator grease to ward off mosquitoes, camped on the island from before the 1500s until their expulsion and disappearance in the mid-1800s. Spanish explorer Cabeza de Vaca and his crew likely shipwrecked near here in 1528 en route to Mexico, and the pirate Lafitte brothers landed on the island in 1817 to establish a base of operations. Jean Lafitte, Galveston’s first known European settler, turned the island into a center for smuggling and privateering before leaving in 1820. In 1836, the first government of the Republic of Texas took refuge from the Mexican army here. Four major storms struck between 1867 and 1886; the great storm of 1900 killed at least 6,000 people, prompting construction of the city’s seawall. Maco Stewart Jr., born on the island in 1896, returned after World War I to serve as president of Stewart Title Company of Texas, founded by his father, Maco Stewart Sr., also a native Galvestonian. In the 1940s, Stewart Jr. raised Brahman-cross beef cattle on the coastal prairie west of town, living with his family in a home built on the property by another prominent Galveston businessman, George Sealy Jr. (the property was purchased by Stewart Sr. in 1933). The state acquired these 2,000 acres in 1969, and the park opened in 1975. Tilting from northeast to southwest, Galveston Island lies between the Gulf of Mexico and West Bay, 27 miles long and 3 miles across at its widest point. My nostalgic pause at the beach-dune intersection comes during a Saturday morning guided exploration, an hourlong program led by volunteer Master Naturalists John and Lynn Wright and Maureen Nolan-Wilde. We gather at the Nature Center on the park’s bay side. The center contains a “touch table” covered in sea beans, shells, bones, seaweed fragments and man-made debris from the beach. Photos on the wall show the dramatic changes to the island since the early 1900s. We caravan to the day-use parking area behind the dunes, where Lynn Wright points out the low grasses and flowers of the coastal prairie. This ecosystem covered most of the island when European explorers first arrived — reports say the island had a total of three trees at the time — but is scarce today. We walk past swales, depressions behind the dunes filled with fresh water (vital for wildlife) and resplendent with cattails and marsh mallows. Next are the dunes, covered in tendrils of morning glory and primrose. Nolan-Wilde stops to tell us about the endangered sea turtles that nest on the island and how we can help protect them by driving carefully on the beach and putting our used fishing line in the PVC pipe at the edge of the boardwalk. Texas Sea Grant coordinates the collection of this fishing line for recycling, preventing it from entangling sea turtles, birds and other wildlife. Finally, we enter the beach, where laughing gulls circle overhead and snowy plovers, sanderlings and willets scurry along the water’s edge. Our guides have come prepared with seine nets, small shovels, sifters, buckets and clear plastic tanks. John Wright stops at the wrack line, the high tide point, and picks up sea beans and tubeworms to pass around. The kids in our group fan out, eagerly digging in the sand and scooping water into the tanks. A drag of the seine net yields a pompano or butterfish, a ghost shrimp and a few crustaceans. We line up to dip our hands in water and touch the fish. The program officially lasts an hour, but most of the group lingers long past that. A guided walk the next morning explores the bay side of the park. Here, the prairie gives way to salt marsh wetlands, which filter impurities from the water and absorb the blow of storms. Wetlands also nurture the young of many marine species; spotted seatrout, red drum, flounder, blue crab and shrimp all depend on the shallow waters and tangles of grass for refuge or a place to lay their eggs. Great blue herons, snowy egrets and roseate spoonbills feed in the salt marshes. We hike out to a wooden observation tower and, from the top, the bright white and pale pink birds stand out like giant blooms in the grass. 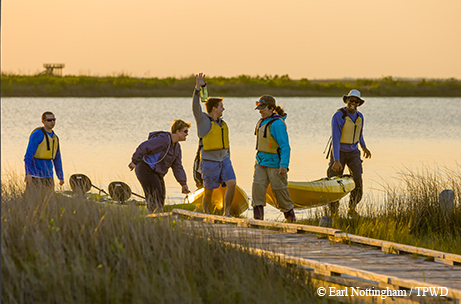 Kayakers wrap up an outing on the bay side, where the park’s several paddling trails are found. In addition to wading birds and shorebirds, mottled and mallard ducks also call the park home, as do raccoons, coyotes, armadillos and marsh rabbits. Beach or surf fishing may land spotted seatrout, sandtrout, redfish, black drum, croaker or flounder. The park also offers guided kayaking (including sunset paddles) and bird watching, and the Nature Center supplies Junior Ranger activity kits. Visitors can rent the recently restored Stewart House and an adjacent ranch house built for the caretaker; the former sleeps eight, the latter six. Both face Como Lake, which began as a freshwater swale behind the dunes. At the ranch house, I spend the evening on the deck watching pelicans and egrets working the pond along with the occasional fish jumping out of the glassy water. If I look out toward the bay, turned golden by the setting sun once again, I can almost see the island the way it was.